Roel Weerts is Online Marketeer at IXON in the Netherlands. He has an excellent understanding of the wants, needs and professional challenges of IXON users due to his extensive sales experience. When you’re looking to provide faster and more meaningful troubleshooting, time syncing is an important factor. The Real Time Clock and NTP server built into the IXrouter allows all connected devices to sync their time. 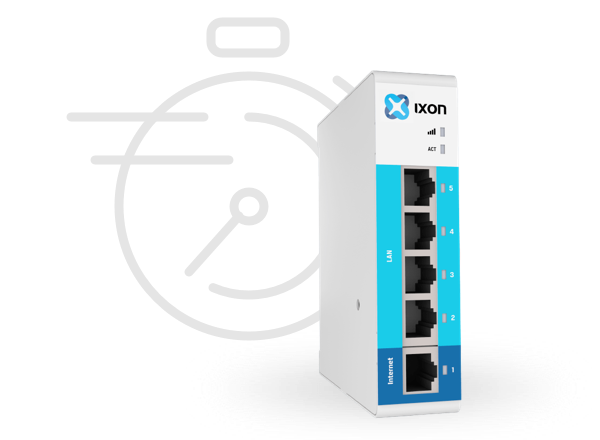 The IXrouter automatically and periodically syncs its own time with the IXON Cloud, making sure that the entire machine line connected to the IXrouter will stay synced in time. Let’s say you have a big machine line with multiple PLCs, HMIs, a robot, etcetera. Imagine you have to manually set the clock for each of these devices or parts. Not only is this a lot of work, but there’s also a high probability of inaccuracies in time between the devices. In addition, it’s likely that the clocks won’t stay accurate as time goes on. They may drift as much as a second per day. Any meaningful time synchronization will be impossible if these clocks are allowed to run on their own. The NTP protocol makes sure that all devices occasionally sync their time with one NTP server, which is built into the IXrouter. Every device that is connected to the IXrouter will have one NTP server as a source for time. This ensures that they all have the exact same time. If you want to make any meaningful interpretation on information the machine provides, time syncing will prove to be very important. For instance a machine line has an issue. The service engineer will need to check the log files of the machine line controllers to find factors that may have caused the failure. Looking at the specific moment of the issue and back in time, meaningful conclusions can be drawn. Perhaps one of the parts in the machine line is the source of the failure, which may have caused all other consecutive machine parts to go into error as well. However, it’s harder to draw conclusions and find sources of machine failure when time between the devices is out of sync. How do you know for certain when events occurred and if this may have played a role in the machine failure, if you do not have your devices time synced? Synced time guarantees identical time sources and timestamps in the log files of all connected devices. The resulting information sources are more reliable and help speed up troubleshooting. This in turn saves the service engineer time. In the end, it’s all just a matter of time! Try the IXrouter 30 days for free. Don’t miss out on our latest product developments, news items and knowledge shares by IXON cloud experts! Make sure you sign up to our newsletter and stay up to date. Improve your machine services globally with IXON’s industrial IoT platform. The IXON Cloud is completely web-based and accessible on your smartphone or tablet. Questions? We can help you. For direct support, you can also call us.